The Renault ZOE e-sport concept car revealed at the 2017 Geneva Motor Show showcases Renault’s commitment to the ongoing development of electric vehicles. Based on the all-electric ZOE’s supermini platform, ZOE e-sport concept draws on Groupe Renault’s three years of success in the FIA Formula E Championship. This all-electric single-seater series, fought on challenging street circuits around the world, has proved a popular and accessible way for the public to enjoy high-performance electric racing. The two-seater ZOE e-sport concept echoes the styling of the latest Renault single-seater race cars, and its colour scheme reflects the livery of the e.dams team. The lightweight body structure is made of carbon fibre, and the car tips the scales at just 1,400kg, including the battery (450kg). This minimal weight in addition to excellent aerodynamics, power close to 460bhp and torque of 640Nm, helps the car to accelerate from standstill to 62mph in 3.2 seconds. “The brief for the Renault ZOE e-sport concept couldn’t have been simpler: ‘Have fun!’. So we came up with something midway between a production model and a racing car… It’s perfect for lovers of extreme driving sensation,” said Stéphane Janin, Director, Concept Car Design. 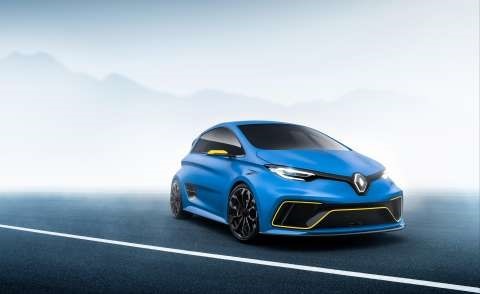 “At Renault, we believe that electric cars are capable of addressing the needs of all types of customers, with the emphasis on driving enjoyment… The Renault ZOE e-sport concept is a stunning expression of this,” said Éric Feunteun, Director, Electric Vehicle Programme. The ZOE e-sport concept’s connection to Formula E is immediately apparent thanks to a colour scheme inspired by the reigning champion Renault e.dams team’s 2016/2017 livery. The dominant colour is Satin Blue with flashes of yellow on the door mirror and the front and rear bumper beading. The bumpers, lip spoiler and headlight/air intake surrounds have a carbon fibre finish. The 20-inch diamond-cut aluminium alloy Sport wheels feature contrasting angles highlighted by a two-tone finish in black and Shadow Chrome. These rims come with a central locking nut. The overall design retains traditional Renault styling cues, plus elegant flourishes from higher-end high-performance models. The ZOE e-sport concept has extra-tinted windows. Its doors are opened by a simple tap on the ‘open’ zone incorporating tactile sensors. The headlights carry over the C-shape that has become a hallmark of the latest Renault models. The prominent vertically mounted backlit Renault front and rear diamond logos echo the styling of the Renault Trezor concept car unveiled at the 2016 Paris Motor Show. Inside the cabin, the colours and materials express the car’s sport pedigree. 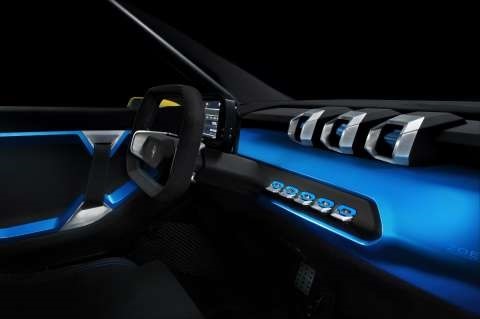 Black is the dominant colour, with a few splashes of blue and – notably for the controls – aluminium. The seats, steering wheel and door panels are trimmed with overstitched Alcantara. The ZOE e-sport concept’s stiff, lightweight structure allows for high performance, with superb grip and handling. Like the Renault e.dams Formula E single-seater, the bodywork is made from carbon fibre. The chassis features a tubular steel roll cage with protective Kevlar panels. It complies with FIA safety standards, allowing the ZOE e-sport concept to be used on race tracks. Outstanding aerodynamics are achieved with the aid of a front air dam, flat undercarriage, a Formula E-inspired diffuser and a large carbon fibre tailgate spoiler with a linear braking light. Inside, the ZOE e-sport concept has two Recaro bucket seats equipped with competition harnesses and a driving position that is ideal for track driving. A rectangular steering wheel gives drivers the broader field of vision enjoyed by Renault’s Formula E drivers. As in Formula E, the driver can adjust the powertrain settings and control energy consumption. The dash panel features three zones that permit management of the gearbox, driving mode (four options available) and brake distribution. The ZOE e-sport concept’s powertrain is inspired by technologies developed by engineers at Renault Sport Racing and Renault e.dams. Two motors deliver a total of 340kW – almost 460bhp. By comparison, rules laid down by motorsport’s governing body the FIA, limit Formula E single-seaters to 270bhp. The two motors are identical, with one at the front of the car, the other at the rear. And, as in Formula e, they feature high-capacity permanent magnet technology to maximise energy efficiency. To exploit all this power, the ZOE e-sport concept’s battery has a capacity of 40kWh. As in Formula E, an air-and-water cooling system with a front-mounted radiator is used to make sure that the battery and control systems operate at the ideal temperature. The ZOE e-sport concept also benefits from Renault’s Formula E experience in terms of optimised power delivery to the wheels. Renault-developed power electronics govern battery energy accurately and dynamically to meet the driver’s needs at any time. Energy management is completely configurable and adjustable after each drive or during race weekends. The electronic settings offer four driving modes that adapt, depending on whether the driver wants performance or a longer range. They can also be tailored to suit different types of circuit and driving styles, adjusting the power delivery between the two motors to place greater emphasis on front- or rear-wheel drive. The design and set-up of the ZOE e-sport concept’s chassis benefit greatly from the expert input of Renault Sport Racing’s specialists and their work on Groupe Renault’s most extreme performance cars. Built by TORK Engineering, the tubular steel chassis is based on those used by Renault Sport cars competing in hill climbs and ice races. The ZOE e-sport concept has a lowered ride height, wider track and four-wheel drive to guarantee maximum cornering stability. The double-wishbone suspension front and rear was developed for racing and maintains efficient axle geometry in all situations. The Öhlins four-way adjustable dampers are another by-product of motorsport and can be adjusted to suit different circuit types or driving styles, like those selected for the Renault Mégane R.S. 275 Trophy-R. The ZOE e-sport concept’s large, 20-inch wheels are able to transfer all the car’s significant power to the road. Fitted with 245/35 R20 tyres, they are an unusual sight on a racing circuit. Suitably large brake discs ensure competition-style stopping power. The ZOE e-sport concept accelerates to 62mph (100kph) from rest in 3.2 seconds. Its maximum speed is capped at 130mph (210kph) and takes fewer than 10 seconds to achieve it. The high torque output of 640Nm (320Nm per motor) is available almost instantly. Electric motors deliver all their performance the moment they are activated, and it takes only a few tenths of a second for the ZOE e-sport concept’s motors to reach 4,300rpm. The acceleration is linear, uninterrupted by gear changes. The electric powertrain does not have the jolts or loud noise emitted by an internal combustion engine. Like those generated by a Formula E car, noise levels are limited to the sounds of the transmission and tyre scrub. Renault tops the electric vehicle sales charts in Europe in a consistently expanding market. 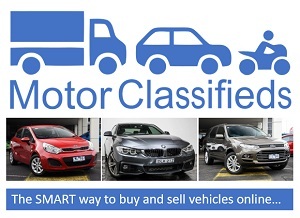 Renault is still the only carmaker in the world to offer a commercially available comprehensive range of electric vehicles to cover a wide variety of uses.